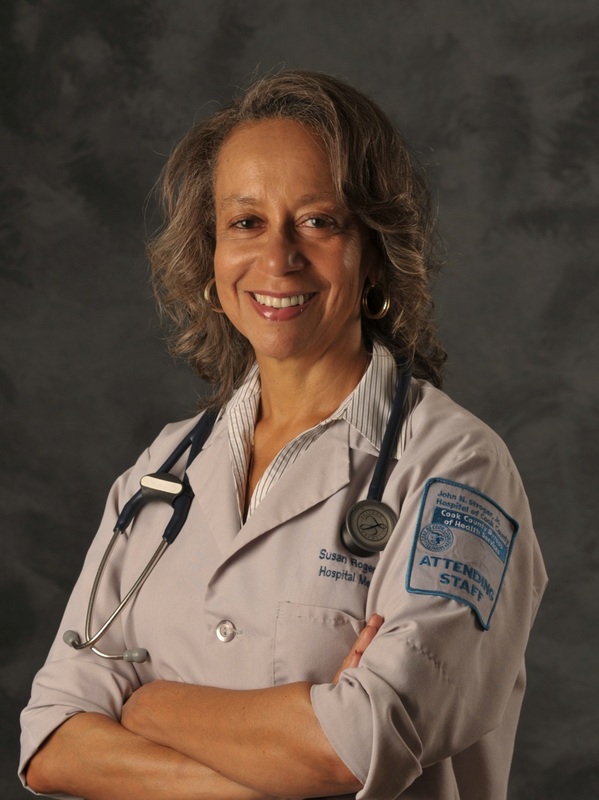 Dr. Susan Rogers, although retired, continues to volunteer as an attending hospitalist and internist at the John H. Stroger Jr. Hospital of Cook County in Chicago, formerly Cook County Hospital. Before retirement she was a hospitalist and Director of Medical Student programs for the Department of Medicine at Stroger Hospital. She is also an assistant professor of medicine at Rush University, where she remains active on the Committee of Admissions for the medical school. She has received numerous teaching awards from Stroger Hospital, Rush University, and Rosalind Franklin University. Dr. Rogers received her medical degree from the University of Illinois College of Medicine and completed her residency at Cook County Hospital, where she also served as Chief Resident. She is a national board member of Physicians for a National Health Program, a national physician organization that advocates for Medicare for All/single payer healthcare. Dr. Rogers is a fellow of the American College of Physicians, and a member of the National Medical Association.